Google announced yesterday a new Google search view for the left hand panel named Recipe View. 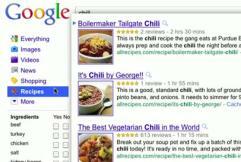 This view lets you quickly search for recipes of all kinds with special filters that help you narrow your search. You can filter by food type such as appetizer, entree, dessert, etc or preparation time, cook time, nutrition data and/or ingredients. For publishers and webmasters who run food sites, this can really help increase your exposure for your web site. 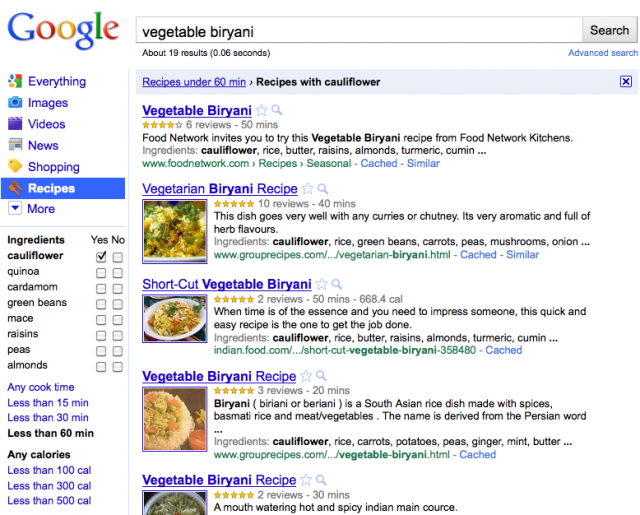 Google added a recipe markup format where you can markup your content and hope Google includes your recipes within Google's Recipe View. name (fn) Required. The name of the dish. photo Image of the dish being prepared. published The date the recipe was published, in ISO date format. summary A short summary describing the dish. review A review of the dish. Can include nested review information. prepTime The length of time it takes to prepare the recipe for dish, in ISO 8601 duration format. Can use min, max as child elements to specify a range of time. cookTime The time it takes to actually cook the dish, in ISO 8601 duration format. Can use min, max as child elements to specify a range of time. totalTime (duration) The total time it takes to prepare the cook the dish, in ISO 8601 duration format. Can use min, max as child elements to specify a range of time. nutrition Nutrition information about the recipe. Can contain the following child elements: servingSize, calories, fat, saturatedFat, unsaturatedFat, carbohydrates, sugar, fiber, protein, cholesterol. These elements are not explicitly part of the hRecipe microformat, but Google will recognize them. instructions The steps to make the dish. Can contain the child element instruction, which can be used to annotate each step. yield The quantity produced by the recipe (for example, number of people served, number of servings, etc). ingredient An ingredient used in the recipe. Can contain child items name (name of the ingredient) and amount. Use this to identify individual ingredients. author Creator of the recipe. Can include nested Person information. Forum discussion at Google Web Search Help and Google Blogoscoped Forums.